Minecraft videos – why are they so addictive? Minecraft, the online world that most parents simply don't understand, is now officially the most watched game of all time on YouTube. According to the video-sharing site, the game that allows children to build worlds made out of blocks – a bit like Lego – has also become the most searched-for term, behind “music”. It bears out earlier research from YouTube video research firms Newzoo and Octoloy, which found that Minecraft material notched up more than 3.9 billion views on YouTube in March 2015 alone. None of this will come as a surprise to the many parents who have become ‘Minecraft-widows', desperately trying to entice their children to go on a bike ride, throw a ball, visit the park – anything other than while away the hours watching other people build things with little green bricks on the internet. The fact that parents are worried about the varying levels of enthusiasm/obsession/addiction that their children display when playing Minecraft has been well-documented. In numerous posts and articles online, they complain that the game is taking over their children's lives, that they become irritated when they aren't playing it, they neglect homework, chores, even going to the toilet, to keep on playing. But for other parents, children playing the game is OK – at least they are doing something vaguely creative – but spending hours mindlessly watching others playing it represents a whole new level of obsession. Is Mark worried about the amount of time his boys devote to Minecraft? I've got two boys who, it is fair to say, are closer to being Minecraft fanatics rather than just fans. That means they spend a lot of time watching YouTube videos of other people playing the game in its various guises. Right now, they probably watch more YouTube than regular TV. Do I mind? A little, but I'm aware of the place that Minecraft occupies among my boys and their peers. Cutting them off would mean severing a strong link to their friends. And that interest has a positive aspect too. It's made them intimately familiar with Minecraft down to its most esoteric commands, is nurturing a desire to make their own mods for the game, has led them to run their own game server, make and edit videos and curate their own YouTube channel. It's by no means passive consumption. There is certainly a rich vein of Minecraft-related content on YouTube – around 42 million videos that range from tutorials offering ideas on new things to create, “Let's Play” videos, essentially footage of other people playing the game, and new ways to modify their Minecraft worlds. There are also hundreds of channels devoted to Minecraft, including popular ones such as Yogscast and SkyDoesMinecraft. Some, dedicated specifically to children, have become internet sensations. Stampy, a YouTube channel narrated by a cat has more than 5.6 million subscribers and nearly 3.4 billion views. In 2014, it was the fourth most popular YouTube channel. Others are less appropriate, narrated by what one parent described as “helpful but sweary” adults. Bec Oakley is founder of MineMum, a blog intended to help guide parents through the minefield that is Minecraft. She is not surprised that it has become so popular on YouTube. “YouTube is this generation's television. It's how [children] entertain themselves, learn, share. Watching others play Minecraft allows them to extend their experience of the game, to share it with others and to learn from each other,” she told the BBC. “There's a huge amount of content available, and much of it is incredibly engaging, educational or useful for kids,” she added. She acknowledged that Minecraft is “definitely a game that kids can become obsessed with, and watching YouTube can be part of that obsession”. But she added that she doesn't think it signals a problem in itself. “A better indication of that is how much time is being spent, and the flow on effect on health and mood. Mojang, the maker of Minecraft, never designed the game specifically for children. The brainchild of Swedish videogame programmer and designer Markus “Notch” Persson, Minecraft was inspired by a series of other games such as Dwarf Fortress, amusement park simulator RollerCoaster Tycoon and strategy game Dungeon Keeper. Eventually Mr Persson founded Mojang, which last year was bought by Microsoft. His firm has always encouraged fans to put videos up on YouTube. While Nintendo uses YouTube's Content ID copyright system to make its claim videos featuring its games – accruing any advertising revenue they generate along the way, Mojang has always taken a more relaxed approach. “We've essentially outsourced YouTube videos to a community of millions of people, and what they come up with is more creative than anything we could make ourselves… There's no damage to us from YouTube,” Mojang's chief operating officer Vu Bui told the Guardian newspaper last year. At the same time as Minecraft has become a sensation, so too has YouTube begun to appeal to a younger audience – in February 2015, nine of the top 20 YouTube channels were aimed at youngsters. And it isn't just Minecraft videos that they are watching. My son, who never really took to Minecraft, will happily watch videos of other people playing Fifa. Often for hours. And children do get obsessed with things. There is a long list of toys and games that have been greedily coveted by kids, only to be discarded a few years later. And maybe Minecraft will also end up in the back of the toy cupboard – and children will return to watching cats on YouTube like every other self-respecting citizen. 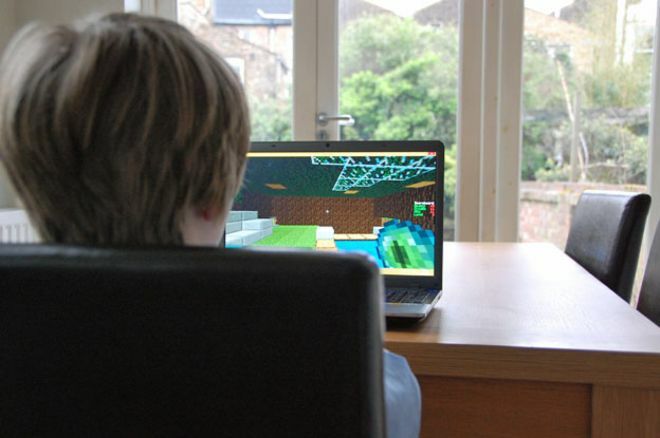 What effect does playing Minecraft have on the brain? There have been many studies, some controversial, into whether gaming affects the brain. Researchers in China, for example, performed magnetic resonance imaging (MRI) studies on the brains of 18 college students who spent an average of 10 hours a day online, primarily playing games like World of Warcraft. Compared with a control group who spent less than two hours a day online, gamers had less grey matter (the thinking part of the brain). And, as far back as the early 1990s, scientists warned that because video games only stimulate brain regions that control vision and movement, other parts of the mind responsible for behaviour, emotion, and learning could become underdeveloped. In terms of specific studies on Minecraft, an article penned by psychologists Jun Lee and Robert Pasin in Quartz magazine, suggests it may not be as creative as parents might hope: “In Minecraft, kids can build and explore new worlds and manipulate them with unprecedented control and precision.